With the late start, the benefits of careful seed placement still apply — and perhaps more than ever. Taking an extra day or two at seeding to create a uniform well established canola field may save up to a week at harvest as these crops tend to mature earlier than spotty crops with low plant counts. 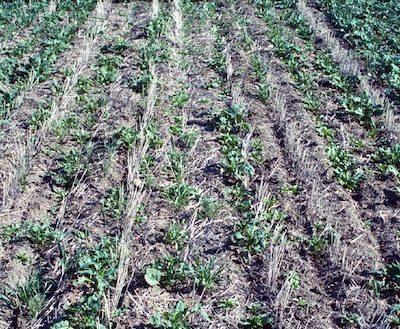 Canola establishment also depends on early weed control. Many fields will see an overall economic benefit if sprayed first and then seeded 1-5 days later — depending on weeds targeted and weather conditions. All is not what it seems. Can you tell what’s going on in this photo. “Read more” for clues, the quiz and…the answer. Without attention to seeding speed, drill maintenance and other factors that lead to poor seed survival, a canola stand can easily look like this one. 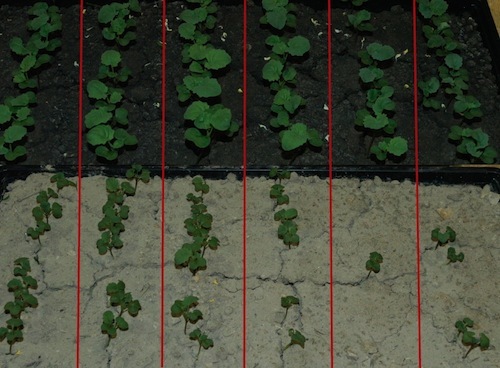 A uniform 7 to 10 plants per square foot helps canola meet its yield potential AND mature faster. It’s seeding season. Is your sprayer ready? A pre-seed burnoff will result in higher yields versus no pre-seed burnoff. Seeding can begin fairly soon after a burnoff. For annuals and winter annuals, glyphosate needs only 24 hours to get to the growing point. After a day, the crop can be seeded. For perennial weeds, 3 days should be enough in sunny and warm conditions but 5 days is recommended before seeding if weather is cloudy or cool. Hit these volunteer canola plants when they’re small with a pre-seed burnoff. Volunteer canola is a weed and competes with the crop for nutrients and water and sunlight. Volunteers do not have seed treatment, so they can introduce seedling diseases and increase flea beetle pressure. Also, volunteers in non canola years provide a host for blackleg, clubroot and insects, reducing the effectiveness of crop rotation for managing these issues. Yield potential tends to drop off with late May and early June seeding dates. At those seeding dates, it will be important to look at factors that can delay maturity and increase the potential for yield and quality — green seed — losses. CCC agronomy specialists have a new project for 2013 — the Ultimate Canola Challenge (UCC). The underlying challenge is to follow all best management practices (BMPs) to see how canola yields when you “do everything right.” Additional treatments — such as boron — will be evaluated to see if they provide an improvement in yield, quality, maturity and return on investment. Stay tuned for tour dates. Canola Watch will provide regular updates throughout the season. Have you met the Canola Council of Canada agronomy specialist for your region? You have many opportunities to connect with them in a year.